Ideas interrupt each other in the manner of the lesser but proficient bands of the time, but only after they have been given due attention, which makes the sudden transition wanted and apt, rather than a poor articulation. We can also hear quicker sections of music that feature rapid transitions between frenetic riffs, these invariably signal bridges and preparations in this strand of death metal. They provide a counterbalance to the more ‘enunciating,’ riffs that serve to anchor the music and give it a strong thematic context that the listener can identify clearly. Said enunciating riffs do not need to be slow, but they are definitely ‘singable’ (cantabile), even in their coarseness. In terms of development, the most crude of death metal structuring methods is utilized: that of the riff salad. A direct effect of the riff salad is that the beginning, the middle and the end of songs do not sound particularly made for that place in the narrative. Rather, the resulting structure is the result of a savage cutting and pasting that follows a bestial sense, and is thus opaque to attempts at rationalizing it. Like underground punk, this simplicity in madness is at the center of its particularity, and it feeds into what allows it to transmit its sense of alienating brutality. All in all, Thrombus exhibits a satisfactory dominion of the death metal language, and gives us a historical snapshot of the era. We can easily place Thrombus in the scale of quality alongside the likes of God Macabre The Winterlong (1991), while it does not reach the twisted peaks reached by the sure footsteps of Carnage Dark Recollections (1990). All that being said, one feels compelled to point to a classic like Demigod Slumber of Sullen Eyes (1992) as the supreme example of riff-oriented modal death metal oriented towards ‘moments’ rather than strong narratives. 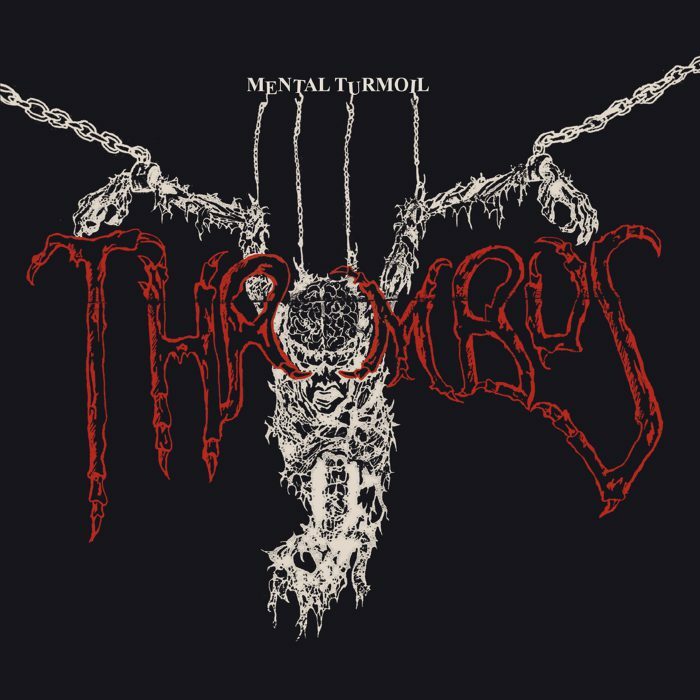 Thrombus Mental Turmoil was reportedly released in 1993 in tape format, and limited to 100 copies. Fortunately for interested listeners, La Caverna Records  has recently re-released the album also in tape format, limited to 400 copies, and has made it available for purchase and unlimited streaming on bandcamp. Death Metal Underground is calling for writers (actual or in potential) to join our team. If you are capable and willing to contribute weekly or more often to our growing encyclopedia of underground metal, DMU Needs You! I hear the Obituary influence in the last song, but perhaps there is also a certain Americanism to these diatribes such influenced by personalities like Paul Ledney. There is a fine line between riff-salad and riff-maze. This band certainly leans more toward the riff-salad end of things, as mentioned in the article. If only they took it one step further, harnessing the chaos of the brutish riff-salad writing style to create something truly demented, like the murderously schizophrenic focus and intensity of Adramelech or Demigod. Good death metal though. And this would be an excellent topic to discuss: The fine line between riff-salad and riff-maze. Would you care pointing out outstanding albums in either of those categories, according to your perception? Here are the best examples I could come up with. We’ll start with speed metal, or ‘thrash.’ Look at Slayer’s ‘Hell Awaits’ (1985) with its twisted left turn riff sequences that still progress the songs in such a way as to not only confer new meaning to preceding riffs and themes, but also set up ending song sections for increased brutality. Compare that to Dark Angel’s final album, ‘Time Does Not Heal’ (1991), in which every song has more riffs than you can shake a stick at, but none of them thematically or melodically complement each other, even though they lie adjacent with one another. In this case, they serve only to emphasize and follow Gene Hoglan’s rhythmic changes. No one riff gives meaning to another. Now for death metal. Compare Morbid Angel’s ‘Alters of Madness’ (1990) to Cannibal Corpse’ ‘Butchered at Birth’ (1991). Same exact thing. Individual riffs in either album might be cool, but in the first case, they serve each other to strengthen the cohesive, noble impurity of the songs, while in the second case, you end up listening to a jumbled, phraseless mess of brutal retardation. Good points. And more importantly, these things go beyond the analysis. Even if you were not consciously aware of the technical whys and hows, if you really sit down to listen to the music, especially repeatedly, you start to feel these things. Regarding your last point, I think that’s exactly right. There’s a ‘spiritual’ effect certain albums have on the psyche of the listener, fomenting the artistic expression of the authentically powerful Nietzschean ‘blond beast.’ Whether or not this is recognized empirically, there’s an overwhelming ‘feel’ these Dionysian riff-mazes often induce, affirming the person’s will to power. This is a mental shift that clamorous riff-salads are incapable producing. This band is lacking compared to God Macabre who are already lacking. Tolerance for such is what bred a certain kind of low quality organism which the Conqueror hoodie crews remove through the human equation via unsavory means. God Macabre is not better, it just uses a different writing approach. The quality is comparable, style aside. Just some pictures that are interesting. A century of people culminating to the great opaque conversation of diversity. I always enjoyed this album, actually one of my preferred Death Metal albums. I think I read that they are from Spain.